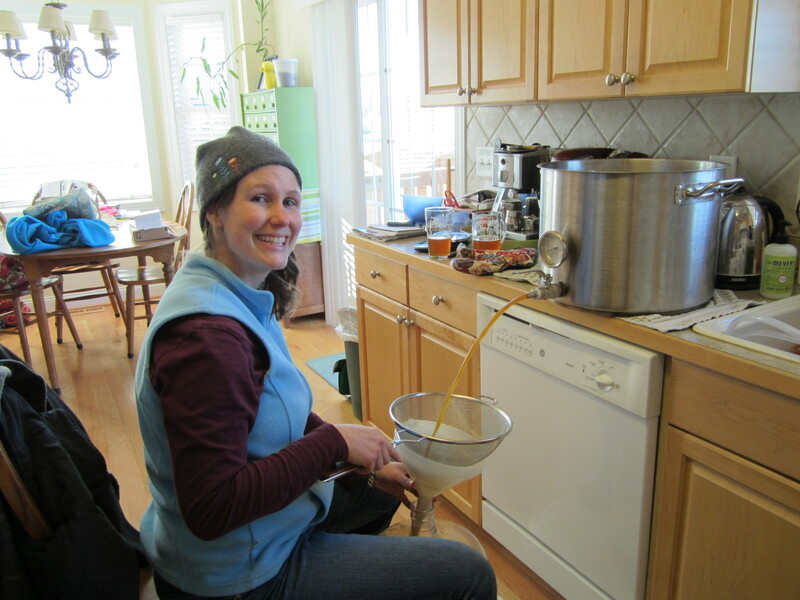 Brew day with a baby – not always the easiest experience! So yesterday, we brewed our Pliny the Elder Clone, version 2.0. This is one of DB’s absolute favorite beers and a VERY expensive beer to brew. It has 14 oz of hops! Do you know how much that costs?!? Anyway, we thought we had it all figured out. Start steeping the grains during LB’s noon bottle, put her down for a nap once she was milk-drunk, and knock out the brewing before she wakes up. 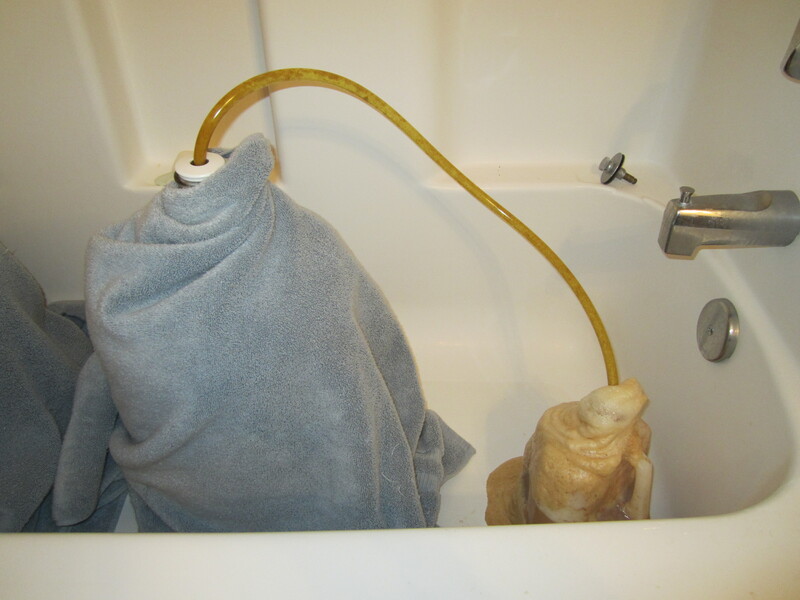 This plan worked very well up until it came time to transfer the chilled wort to the carboy…. We have a way we transfer our wort that strains out the hop detritus and aerates it really well. The main problem with this method is that it can cause the wort to get really foamy and actually foam over the carboy before we get to the appropriate volume. Which is fine – that’s why we have rugs dedicated to brewing that we put down under the carboy. But yesterday, as we’re racking the wort, LB starts to fuss a bit. Not a lot, just enough to let us know she’s there and is rapidly approaching hungry. So I’m a bit distracted, the DB’s a bit distracted, and before you know it – we’ve added WAY too much wort to the carboy, it has foamed everywhere, and there’s not really enough head space left to add our yeast starters!!! And with an OG of 1.078, we need all the yeast we can get! Ever the optimist, I point out that we’ve made this mistake before (what can I say? I’m bad at knowing when to stop filling the carboy!) and that we should be fine. DB is not quite so convinced and points out that, if the beer is ruined, it’s a very expensive mistake. Taking the wait and see approach, we put the beer upstairs in the guest bath (our “brew room” – drives my mom nuts!) and anxiously await fermentation. *Update: Fermentation has begun! Even with the lack of headspace and possible under-pitching, lag time was about 2 hours. The beer is now bubbling merrily away. Fermentation is in full swing! This entry was posted in Brewing and tagged Pliny The Elder by BrewsterMama. Bookmark the permalink.